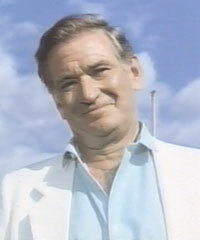 Rod Taylor plays an former naval commander, Bill Anderson, in this Spanish film that's also known as "Hot Spot." Bill Anderson is a retired American boat captain living on his sailboat in Marbella, a resort town on the southern coast of Spain. It's a hot spot -- a hideaway for the rich and famous and a popular vacation destination for English tourists. One night, Anderson (who is called "Commander" by all who know him) spots a woman go overboard on a nearby yacht. He dives in and rescues her, but then the owner of the yacht deliberately smashes into Anderson's sailboat. The damsel in distress is Deborah, played by Swedish actress Britt Elkand. Deborah is the former mistress of a decadent, evil tycoon, Patrick Arnel -- the guy who rammed Anderson's sailboat. She jumped ship trying to get away from him. Anderson and Deborah conspire to get even by plundering the tycoon's fortune. They enlist the help of the local police inspector and a trio of unlikely conspirators to pull off the heist: a counterfeiter, Germán/Herman (played by Fernando Fernán Gómez), a pickpocket , Juan/John (Francisco Rabal), and an actor, Mario (Óscar Ladoire). Of course, treachery and buffoonery ensue. There's romance too. Rod and Britt quickly become an item. Then, 55-year-old Rod also romances Mirian (Emma Suárez), the 18-year-old daughter the daughter of Germán. The highlights of this film are the beautiful scenery and Rod's mah-velous array of resort wear. Be prepared for lots of bare breasts and a cheesy '80s soundtrack. Your mileage may vary. The only commercial home video release of "Marbella" was on VHS. Here's a link the whole movie, converted and available for download via MediaFire. A glimpse into the making of "Marbella" comes from an unusual source -- a book titled "A Stray Cat Struts: My Life as a Rockabilly Rebel." It's the autobiography of musician James McDonnell, aka Slim Jim Phantom, the drummer for the Stray Cats. 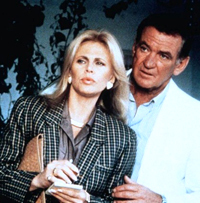 He was also Britt Ekland's husband from 1984-92, and he includes in his book a full chapter about being on location with her in Marbella. Among his own adventures in that lush setting, he also shares behind-the-scenes observations and tells stories of carousing with Rod Taylor. "He and I got along right away," Jim writes. "I don't think he knew any rock and roll bands from the past 20 years, but we talked about a bunch of things, and he had met James Dean, so I had plenty to ask about." Mr. Taylor was back at the set at 8 a.m. every morning and kept going all the way through. ... He sat in his makeshift dressing room on the dock and drank local red wine nonstop. When it was time for his scene, he snapped to it and delivered his lines in a professional manner, and when the director called cut, he tuned out again. I've seen certain guys who could turn it on and off, but he was the best. The action in "Marbella" was filmed along the docks and aboard boats at a marina. Jim observed that "everything was loud and slightly chaotic but functioned well." That is, until it started to rain. A few wet days caused the crew's nerves to fray and had the producer cursing the heavens, but "Britt and Rod continued to turn up, be ready and sit in their respective dressing rooms," Jim wrote. During these rainy days, Jim said he would "bounce around the set between the dressing rooms and hang out and drink with Rod while he told me stories about Hollywood in the 1950s and working with Hitchcock. A few times, we would just go to one of the pubs along the waterfront and someone would come to get him if there was a break in the rain." Jim also tells a lengthy story about a sumptuous dinner at a restaurant owned by a friend of Rod's -- a former boxer from England. "Rod was naturally a blustery guy, and when he got together with his boxer buddy, they shadowboxed each other, roughhoused, and were really loud an animated," Jim wrote. He noted, however, that "Rod Taylor was a world-traveled gentlemen and movie star who boxed a little and liked the sport and liked to drink." Jim had less kind things to say about their host, who stuck Rod with the check. It was an ill feeling that lingered even when the couples got together back in Los Angeles. "We always talked about the boxer who freeloaded at his own restaurant," Jim wrote, "and Rod seemed like he was still mad about it." Another reason for Rod to be mad was mentioned in Stephen Vagg's biography "Rod Taylor: An Aussie in Hollywood." Nevertheless, Rod seemed to take it in stride: "Rod says the film's director [Miguel Hermoso] and producer [José Frade] had a massive fight with each other during filming, so he worked for two weeks for free to help them out." 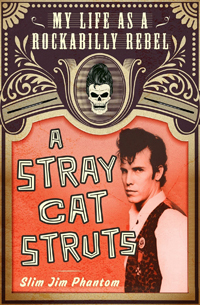 A Stray Cat Struts: My Life as a Rockabilly Rebel, by Slim Jim Phantom. Includes a chapter about "Marbella."